Your face...it's your first chance to make a fantastic impression. And with a face that's smooth, healthy, and fresh, you're ready to take on the world. As your body's first barrier to the outside world, providing immune system support for your skin is not merely a good idea it's a must. 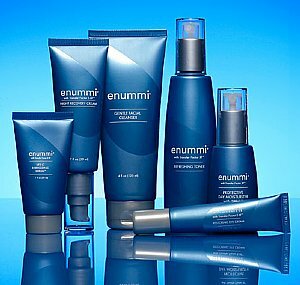 The enummi Face system features 4Life's exclusive Transfer Factor E-XF‚ extract to educate, train, and support your skin's healthy immune response for phenomenal protection. The four-part enummi Face system includes products with carefully chosen, time-tested ingredients to protect, nourish, and revitalize your face. Wash away impurities with the Gentle Facial Cleanser. Refresh, tone, and prepare with the Refreshing Toner. Moisturize, support, and protect with the Protective Day Moisturizer. Repair and rejuvenate with the Night Recovery Cream. Transfer factors are tiny molecules that transfer immunity information from one entity to another, such as between a mother and her breastfeeding infant. Transfer Factor E-XF helps protect your skin with powerful immune system support.